Now THAT sure is pretty! Thanks very much to both of you, Im glad you like it. So far I don't see other users with a problem like mine: I have downloaded Picturesque Weather twice, and the same thing is happening. 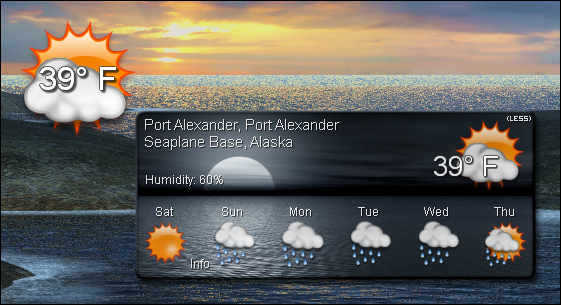 When I run it, I get information in my system tray, but when clicking on that, I see a blur flying from the lower left-hand corner of my tray to right off the edge of my 19-inch screen, but I've never actually seen the widget on my desktop. Is there a special trick I should know? I'm using XP Home, SP-1. Thanks for any help you can give -- I'd love to see what others are raving about! I wish I could get it to work, Richard's work is always top notch. I'm glad it finally works, thanks.. I was having a problem with this after updating DesktopX. Every time I clicked "more" to get the full view, it would just disappear, although the DXWidget.exe was still running. I tried clearing the widget cache and that has fixed it for now. Hi guys, when i use this, the weather always go out of my computer screen and i cant see the thing. Can someone please help me? Thanks.